Another busy week, and I’m still not quite sure where’s it gone. We’ve settled back into the routine of school, work and after school excitement. I’ve dug out assorted hats, scarves and gloves to combat the colder weather, and we have a new set of five frugal things to report. No Beavers were harmed in the taking of this photograph. Rather than heading to the big fireworks display in Ipswich, we celebrated Guy Fawkes night closer to home. 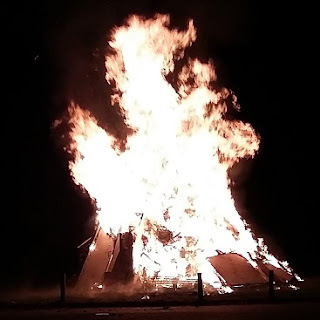 Earlier in the week, we walked down to the Beavers and Cubs bonfire party organised by Hadleigh Sea Scouts. My son is already in Beavers, and my daughter was just about to start in Cubs, so they were raring to go. Every family was asked to bring a big firework, and the leaders organised drinks and snacks in the Scout Hut. With burgers at £2 a pop and cakes for 50p we were unlikely to go bankrupt either. Planetarium in action. In a cupboard. Spot the 80s film reference. After school on Monday, I took the children along the High Street, as they could spend their pocket money. We nipped into a couple of the charity shops where the kids can get more for their money, while simultaneously knowing it will go to a good cause. I also support charity shops for ensuring stuff is reused, rather than getting sent straight to landfill. My daughter spent a pound on baby clothes at the East Anglian Children’s Hospice (EACH) shop. 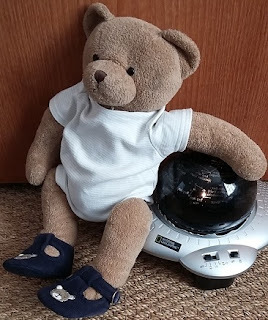 The vest and shoes are the perfect size for one of her (many) teddies, as seen at the top of this post, and far cheaper than buying official dolls’ clothes. My son decided to top up his pocket money with some cash from his grandparents, and splashed out the princely sum of £3.50 on a National Geographic planetarium. I was a bit suspicious of the strange lump of plastic, but it turned out to rotate, light up and even provide a commentary on the stars. 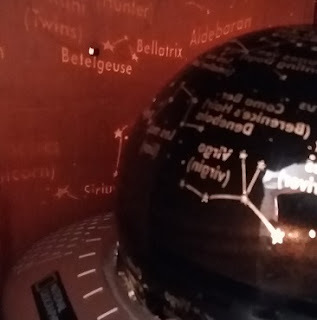 When we took it home and set it going in his bedroom, it created a magical effect in the darkness, with the constellations rotating across the walls and ceiling. I usually have some golden syrup knocking around in the kitchen cupboards. The children love eating syrup with fruit on Sunday morning pancakes, and it’s an ingredient in some of our favourite family recipes, like New Zealand biscuits and choc chip cookies (both recipes in this post, plus a fetching pic of Mary Berry when younger!). 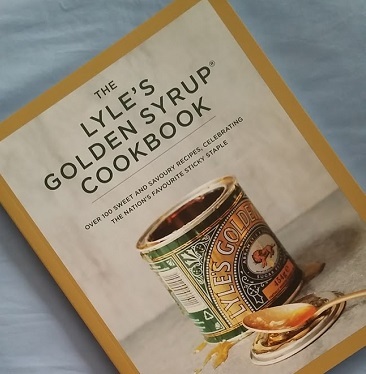 When I was scanning supermarket cashback apps during the October savings challenge, I was delighted to spot CheckoutSmart offering 60p off a tin of Lyle’s golden syrup. I have a real soft spot for their traditional tin design, but am usually wary of buying more expensive branded products. Anyway, I was even more delighted when Morrisons had it on offer, down from £1.15 to £1, so my tin ended up costing just 40p after cashback. To cap it all, the tin had a competition to win one of 5,000 cookbooks, so I bunged my promo code into the website, and bingo, I’m now the proud possessor of a Lyle’s Golden Syrup Cookbook. The hardback version is on sale for £16.59 even on offer*, so I’m very glad to get one for free. 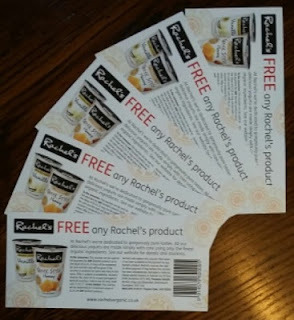 Out of the blue, I received an email from Rachel’s Organic including some delicious looking winter-warming recipes. They also offered me some vouchers, so I could try them out. Will let you know how I get on with trying out soups like pea & watercress and carrot & ginger, rather than my ordinary options. On Sunday, it was cold and raining. We all needed to get out of the house, but couldn’t face getting ravaged by the elements. In the end, we decided on a family trip to the local ten pin bowling alley in Ipswich. It wasn’t the cheapest outing, at £15 for a game for four of us, but we had a great time together, watching the bowling balls go anywhere other than intended. Afterwards, we changed a couple of pounds into 2p pieces and the children tried their luck on the 2p drop machines. We went mid afternoon, so were home in time for dinner, rather than spending extra on food while we were out. Yes, I’m still writing up posts about last month’s saving challenge, with my small changes to spend less, earn more and save a chunk of cash towards Christmas. More on the food front to follow! Over to you: any frugal successes to celebrate? Would be great to hear about uplifting examples, in the aftershock of the US election. Some fantastic frugal things here – nice to have a win and who doesn't love a nice voucher! Thanks Katy! I figure someone has to win competitions, so it's worth an entry here and there just in case. Love your teddy and Rachael Organic is great! Thanks so much for linking up to 5 frugal things! Thanks Becky! Enjoy your #5frugalthings vlogs too.